For many years we’ve stocked Hario’s Mini Mill Slim coffee grinder – which has been a popular choice with many. The Mini Mill Slim a compact straightforward grinder, which is easier than many to adjust for the grind size you wish to use on your latest coffee beans. Well it’s now got a new sibling! 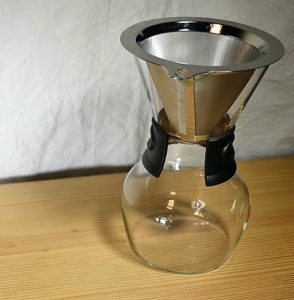 The Mini Slim PRO from Hario is a timely update on the original, with some useful modifications. 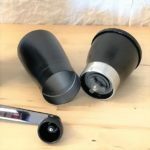 The most obvious feature is the stainless steel in place of many of the plastic parts, and the version that we stock has a black hopper and chamber rather than clear. The clear acrylic lid has also been modified and the PRO version has a silicone grip around the circumference. The important grinding burrs are still ceramic, which is helpful for good functioning and durability. So the key thing is that many of the materials of the classic product have been upgraded, and it has a very stylish look about it! They say “if it ain’t broke don’t fix it” – but his shows that “if it ain’t broke” it may still be upgraded! 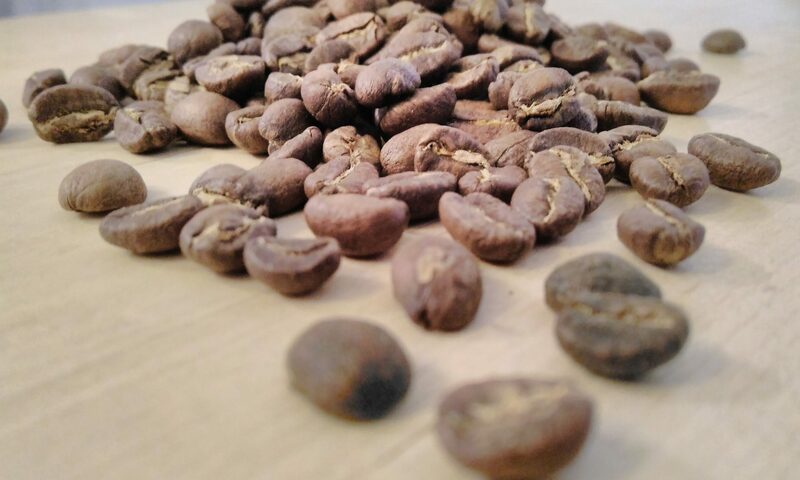 Costa Rica is the source of the Estrella Naranjo beans that are now in stock online at artistrycoffee.co.uk or in person at Duck Farm Court, Aylesbury. 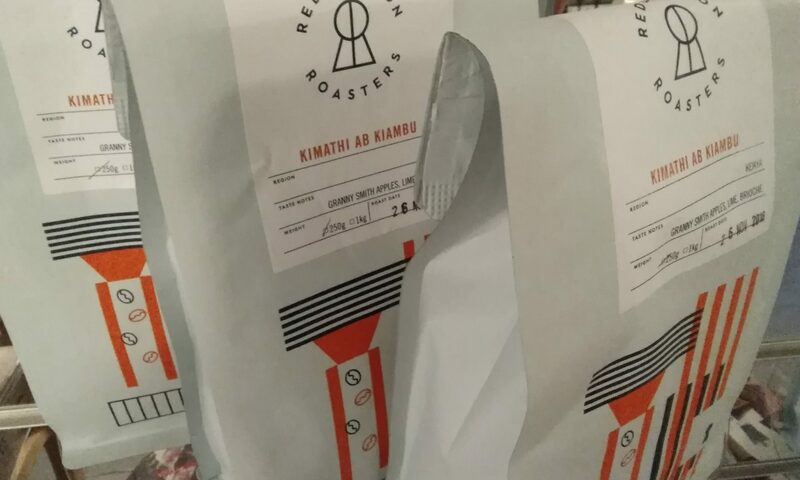 Redemption Roasters in Aylesbury HMYOI roast this bean expertly as part of the project to give young offenders in this institution knowledge of coffee, the roasting process and competition level barista skills. Producers in the Naranjo area of Costa Rica are selected to participate in the Coopro Naranjo R.L. based on the quality of their coffee. The coops aims are to support the producers and promote sustainable production. Strictly ripe cherries are selected through the harvest process, and production of high quality coffee is rewarded. Farms are located between 1300 and 1700 meters above sea level. Estrella Naranjo beans from Costa Rica have tasting notes of Apricot, Nectarine, Citrus. They are sourced from Los Robles West Valley. The ripe cherries are processed with the black honey process whereby the beans are part washed and some of the sticky substance (due to the ripeness) is left on the beans as they dry for longer. The beans are moved at points through the drying process (stirred, raked etc). The black honey process is the most expensive, intensive, and complex process. It results in a more full bodied and flavourful taste. The beans are arabica from the Villa Sarchi variety (Bourbon related) which is well adapted to high altitudes. And a dwarf variety tolerant of strong winds. 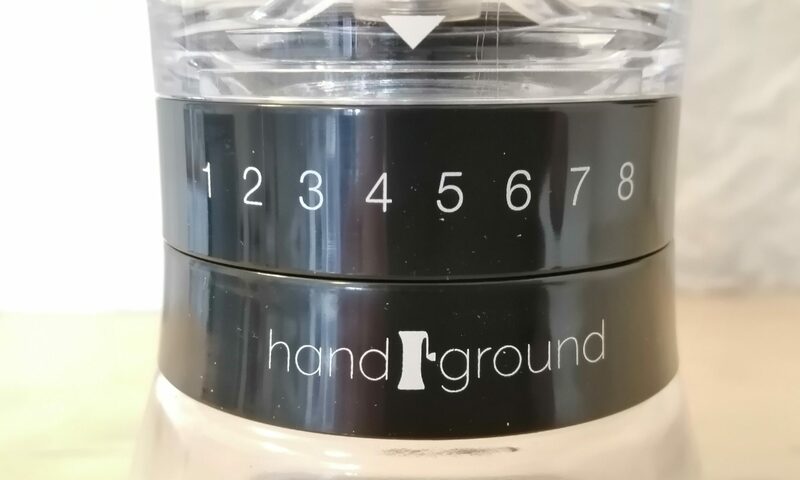 The Handground Precision Coffee Grinder is back in stock at ArtistryCoffee.co.uk or in person at Duck Farm Court, Aylesbury. 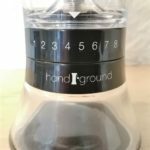 We knew that the Handground Coffee Grinder would be a really interesting product when we first heard about it on Instagram, and then became some of the first backers of it on Kickstarter a few years ago. It was an innovative approach to ask people who make coffee to contribute to the design from all around the world – with choices for the look, materials, accessories, and mechanics etc being made by the crowd through Instagram, Kickstarter and online surveys. Two of the most useful features of the Handground Grinder are the side mounted handle, which makes the handgrinding of coffee beans a simpler process, and the grind control dial, making grind size less guesswork and more precise. It is a large device, and will sit well aside your other coffee making products. 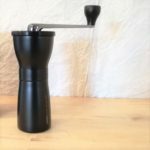 At artistrycoffee.co.uk we again sold out of the crowdsourced Handground Precision Coffee Grinders a couple of weeks ago – but we’re pleased to now have some new stock in. 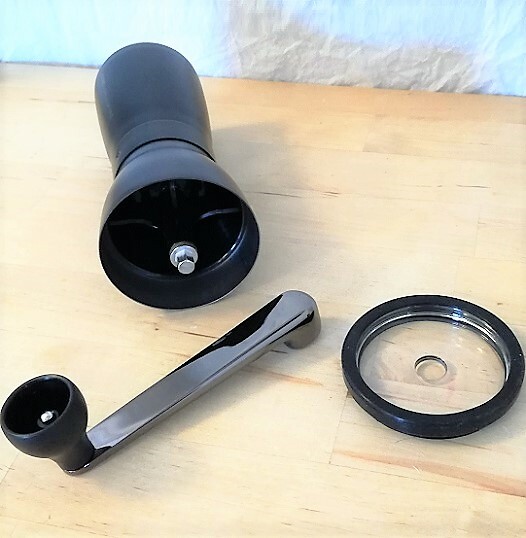 So once more we’ll have the choice of Nickel or Black for this substantial, innovative, and easily adjustable manual coffee grinder. 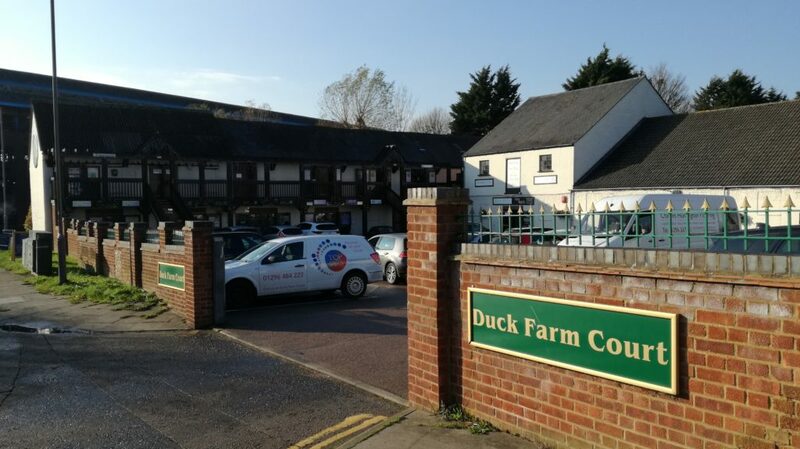 You’ll be able to see for yourself at our Duck Farm Court location in Aylesbury, or order online. At Artistry Coffee we stock speciality coffee beans roasted locally at Aylesbury HMYOI as part of a scheme to help reduce reoffending rates. This social rehabilitation project in Aylesbury gives young offenders opportunity to learn competition level barista skills and under the guidance of a Head Roaster to understand more about coffee beans and the art and science of roasting. We currently have 3 coffee bean origins suitable for espresso and 4 more aligned to pour-over and drip filter coffee making. Plus a speciality coffee in Nespresso compatible pods. See more about our locally roasted coffee beans online at artistrycoffee.co.uk or in person at Duck Farm Court, Aylesbury. (near Morrisons). Our new supply of coffee beans is mainly coming from Redemption Roasters who specialise in high-end coffee roasting in small batches. They’re an operation with an incredible story and mission and we’re delighted to be stocking beans roasted locally in Aylesbury in such a special project. We’ve planned our own move to Aylesbury for a few years now, and we first came across Redemption Roasters at London Coffee Festival in 2017. We knew then that we’d love to work with them for a number of reasons. The coffee beans Redemption roast is ethically sourced generally from small farms and Redemption have first-hand knowledge of the farms. There’s usually a story associated with each. 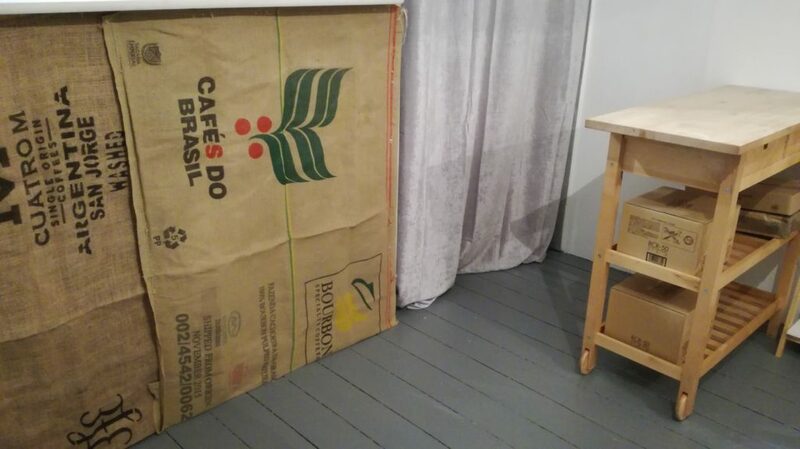 To have locally roasted beans was something that seemed special too, however the project that is behind the whole process is incredibly visionary and valuable. 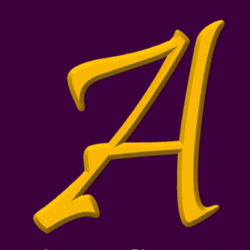 Redemption Roasters are based at Aylesbury Prison – HM Young Offenders Institute. They are part of a project aimed at reducing re-offending rates. The vision is that by skilling up the young people with specialist vocational skills and real prospects for employment there can be transformation in the lives of these young people. Redemption host a café inside the prison where competition level barista skills are learned. They also have a roastery under the guidance of a head roaster and assistant roaster. They take charge of the roasting process and gradually allow the young people more involvement as they prove their skills. Redemption also do all they can to help place the young people in employment on release. So with all of this, and the fact that the coffee tastes great to – we were very exited to confirm that we will be able to sell Aylesbury Roasted beans to our customers – whether in Aylesbury itself at Duck Farm Court, or online. We’re very excited to have painted and taken delivery of our new shelf units and set about stocking them with all our range of handbrew coffee equipment. It is great not just to have a stock-room from where we have to get our products out one by one when we want or need to look at them or photograph them. Now we have permanent display for all our products so it will be easy to demonstrate, talk-about, showcase and feature the individual products. It’s amazing how much the handbrew coffee sector had developed even in the time we’ve been operating Artistry Coffee – so there are always more products that we want to stock. Our location in Duck Farm Court in Aylesbury in Buckinghamshire was once one of the homes of Aylesbury Duck, dating back to the 18th Century. We’re delighted to have a small unit on the balcony area. There are lots of other interesting businesses and shops located here too. We’d love to see people popping in to top up on specialist coffee beans, coffee filters, or select a new handbrew coffee device – or we’ll handle your online order from here. We’ve worked hard on prepping the unit – making sure everything is clean and fresh – and setting our stall so to speak. You’ll find the products featured online with ranges of hario, aeropress, kilner, Chemex, and many others – plus a fun range of mugs, the reusable ecoffee bamboo fibre cups and plenty more. 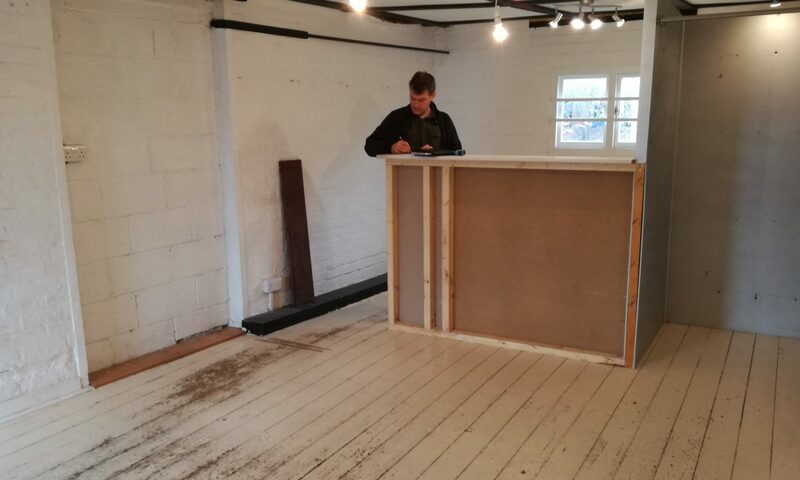 After lots of planning and moving in the last few months – it’s great to be able to have a new home for Artistry Coffee in Aylesbury and we plan to expand our range of stock and upgrade our speciality coffee credentials as part of settling in here. We’ve recently decided that having a small shop where people can actually come in and see our range of handbrew coffee equipment and select their coffee beans would be a great way to take artistry coffee forward. 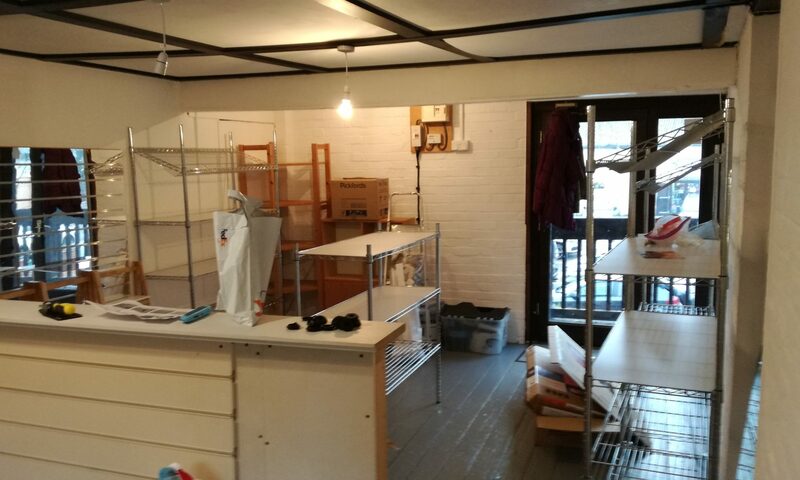 We found a little unit in the lovely Duck Farm Court in Aylesbury and have recently set about giving a bit of a freshen up inside – so we’ve had the paint brushes, rollers and paint pads out as we have been getting the little unit ready to become our new base. 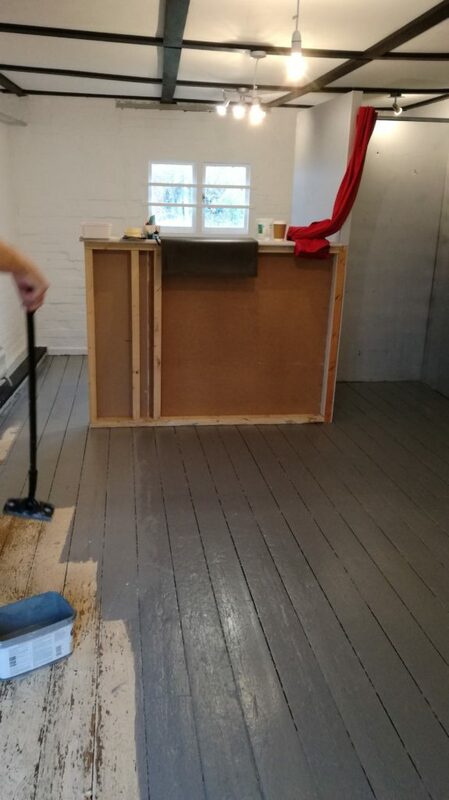 painting Duck Farm Court ready to start the new Artistry Coffee base. Duck Farm Court in Aylesbury, Buckinghamshire is on the site of one of the original old 18th century duck farms where the famous Aylesbury Duck was bred. These days the site has been integrated into the developments around but some of the ancient charm remains. It’s in fact pretty close to the centre of Aylesbury – on Station Way (unsurprisingly near to the station), and just behind Morrisons. 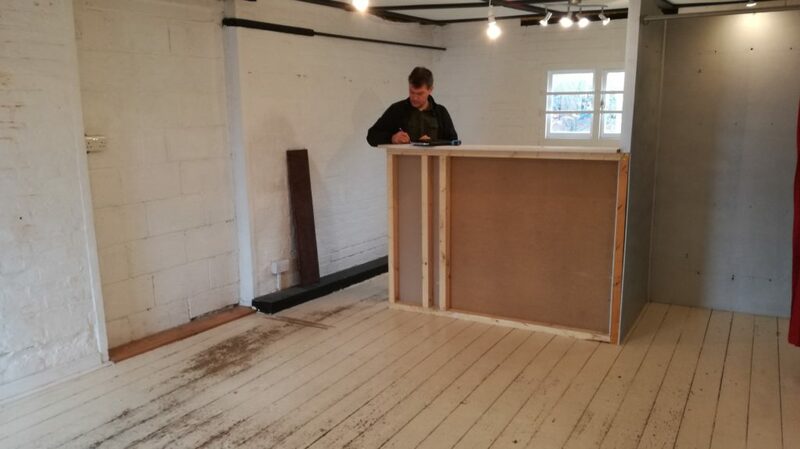 We’re excited to have a new base and look forward to posting on social media from there, and dealing with your orders and also enhancing further our knowledge of handbrew coffee and handbrew coffee equipment. Our normal opening hours will be 11am to 4pm Wednesday to Saturday, but we’ll often be there outside of those times – so you can call on 01923 537547 to see if we’re going to be around. The stunning, innovative Trinity ONE coffee maker is an exquisite piece of design. One of our most extravagant favourite products is an incredible coffee maker from a talented designer and coffee fan in Australia. 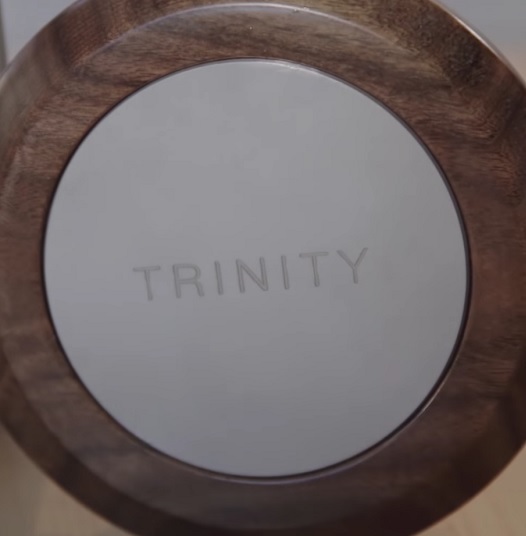 We supported Mark Folker’s Kickstarter campaign to develop the Trinity ONE a couple of years ago and have admired Mark’s commitment and search for quality as he has pursued his idea. We received a small number of the first batch of this device just a matter of days ago, and are taken aback by the result – it’s a beautiful yet functional design featuring kitchen grade stainless steel and American black walnut heartwood timber. 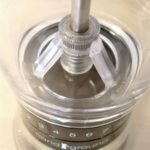 The Trinity ONE can be used to brew coffee by press, immersion, or drip filter method. 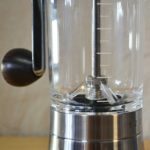 The unique design and approach is unlike any product we’ve seen before – and if you’re interested in handbrew coffee making it’s worth looking at our feature page on Trinity ONE to see what it’s all about. It is genuinely original! Yet the Trinity ONE works with what we know about coffee making to produce an excellent device. It is a large item and that can be a bit of a surprise when you first see it – but this can take centre stage and do its 3 different jobs: drip, press, or immersion. We’re very impressed with Trinity ONE – it will be an elegant addition to any serious coffee shop or be a stunning home coffee making station. 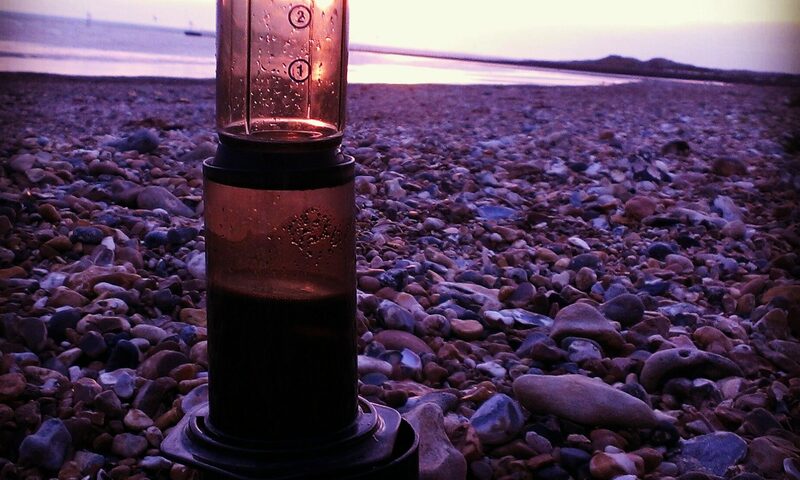 Which way would be your preferred way to use the amazing AeroPress coffee maker? 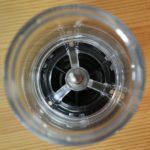 The AeroPress is a brilliant coffee maker which can produce consistently good results, with a couple of different options for how you use it. The classic method is the quickest which is simply..
coffee – water – stir – press. 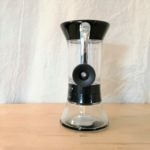 The AeroPress packaging still says stir for 10 seconds and push for 20 seconds – it really can be that easy to make great coffee. 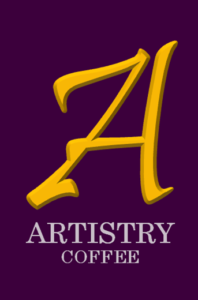 You can watch a video of Artistry’s Sarah demonstrating this method. Then there’s the inverted method which is a little slower and more intricate, but the favoured method of baristas worldwide. This involves pouring the ground coffee and the water into an inverted AeroPress, stirring and then letting the coffee brew for a few minutes. Then adding the filter and mesh cap and quickly turning over to press the coffee through into a mug below. This allows for lots of experimentation with different grinds on the coffee and different brew timings. 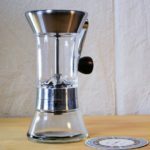 So you can decide if you want a quick well-made coffee that beats instant coffee hands down – or to take more time over the coffee and the experimentation to perfect your own brew technique! 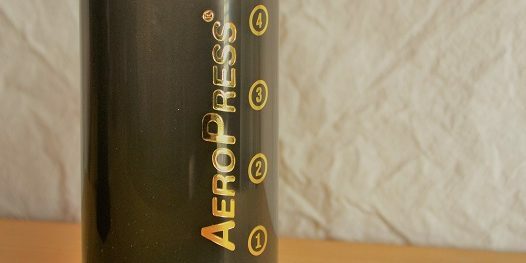 There’s now a Series 5 version of the AeroPress, which has shiny gold lettering and a cloudy brown look to it. Colours and materials used have changed over the years as the design has been adjusted from the original clear with blue guide marks. The Cafe Stal is a lovely little coffee maker and really good value too. It has almost 600ml capacity in the brewing and serving vessel which also features a stainless steel removable pourover filter. The heat resistant glassware is really simple and a delightful compact size. It has an acrylic neck for helping with your serving. 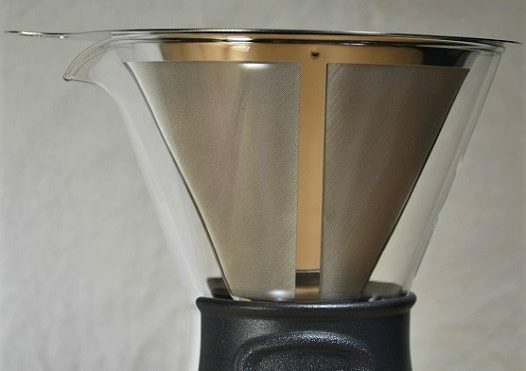 You simply add your ground coffee to the mesh filter which sits in the top section of the pourover vessel. Slowly wet the coffee grounds and let the coffee ‘bloom’ for 30s to 45s, then pour hot water very slowly in spiral or zig-zag motions over the ground coffee for a couple of minutes or so. The coffee grounds will release their flavour as both aroma while your making the coffee and as the coffee itself which collects in the lower part of the vessel. Once you’re done, remove the steel mesh, and sit down with a friend to enjoy your coffee – or on your own for a double dose of caffeine! You can later discard the grounds for compost, rinse the steel mesh and the vessel well and it’s ready for use again. 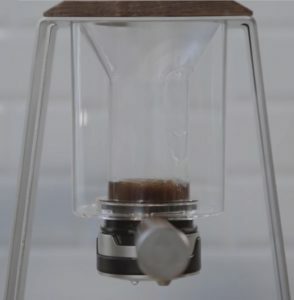 As an introduction to PourOver coffee making this device would serve really well – as it already has a steel mesh filter and is like a tiny version of a Chemex which feels like the granddaddy of pourover makers! See more about the Café Stal from Rayware here. Gradually Piecing Coffee Learning Together….. | CoffeeArtistry on One scoop or two…..